Garrett Christman makes a throw across the diamond. Christman is hitting .464 with a 2.13 ERA so far this season. Collegian file photo. At a practice last fall, Dave Schrage saw Garrett Christman whip the ball across the infield with great velocity. The first-year Butler baseball coach only had one question for his junior third baseman. Schrage said he had a really nice loose arm, and the ball jumped out of his hand. Christman took the mound immediately after practice and didn’t disappoint. Christman’s practices haven’t looked the same since that first bullpen session. A normal practice for Christman consists of him warming up with the team and a throwing partner, base running and defensive work, throwing a bullpen session and working his shoulder with band work and core exercises, capped off with a round of batting practice. Just a day in the life of someone who recorded 55.1 innings for the Bulldogs last season after not touching the mound in two years. Even with the absence, Christman managed to strike out 54 batters, ranked 12th in the NCAA in WHIP (0.90), and finished second in the Big East in hits allowed per nine innings (6.18). Christman also posted a 2.60 ERA with two complete games in 11 appearances. “Sometimes you make some good decisions as coaches and some bad, but this one turned out to be pretty good,” Schrage said. 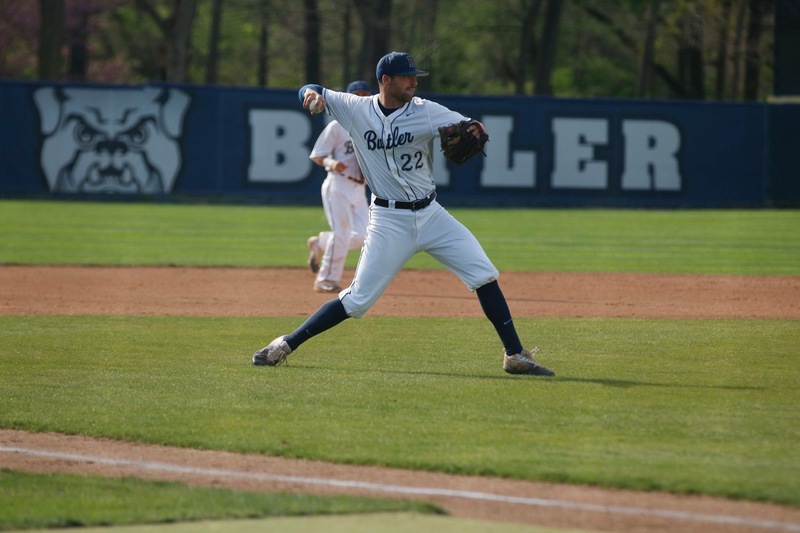 Schrage changed the culture at Butler and delivered their first 30-win season since 2003. He made a lot of changes to lead the program’s revival such as altering the way they practiced and adding new philosophies. But one of the biggest changes involved Christman, who before last year, hadn’t thrown a pitch since high school. Now, the Bulldogs are in the midst of an 8-0 start, and Christman is right in the middle of it. “It’s awesome to have a kid as senior that’s played so much baseball be on the mound, get some clutch hits for us, and playing great defense. It’s like having two players. His versatility is a big plus to our team and our program,” Schrage said. He is currently leading the team in hits and RBI, and has the second highest batting average on the team at .464. He also is 2-0 with a 2.13 ERA from the mound. Christman said his ability to pitch has helped him in the batter’s box. “When I’m hitting in certain counts, I will think, ‘what would I throw to get myself out,’” Christman said. The Noblesville, Indiana, native was born into a baseball family. His father, Kevin Christman, was a former professional baseball player, agent and scout for the San Francisco Giants, where he helped the Giants win three championships in five years. “My dad has always been a role model to me. He introduced me to the game when I was really little and it’s been cool to see his role in the sport with all the connections he has with Major League Baseball,” Christman said. Christman was accompanied by his younger brother Connor Christman throughout his life. As they grew up the Christman brothers would work on their craft together from a young age. Connor took in as much as he could from his big brother. The Christman brothers were teammates at Noblesville High School and won a state championship together. Garrett was the senior shortstop, and Connor played alongside him as third basemen. In his senior year of high school, Christman had a 2.10 ERA, four complete games and a 6-3 record overall. He hit .350 and batted in 27 runs. Christman’s performance led to him being selected by the San Francisco Giants as a pitcher and infielder in the 37th round of the 2014 Major League Baseball Draft. He would turn down the offer to further his education and develop more as a player and man under the guidance of Coach Farley at Butler University. Christman will be eligible for the upcoming MLB draft this summer. Thanks to a spontaneous decision Schrage made last season, Christman can fill in as a pitcher or a third baseman.